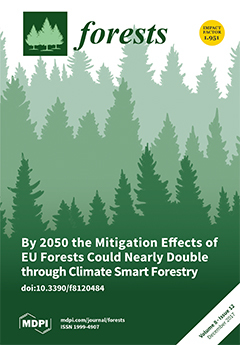 Publication de l’article « By 2050 the Mitigation Effects of EU Forests Could Nearly Double through Climate Smart Forestry » par Gert-Jan Nabuurs, Philippe Delacote, David Ellison, Marc Hanewinkel, Lauri Hetemäki and Marcus Lindner, dans la revue Forests. In July 2016, the European Commission (EC) published a legislative proposal for incorporating greenhouse gas emissions and removals due to Land Use, Land Use Change and Forestry (LULUCF) into its 2030 Climate and Energy Framework. The Climate and Energy Framework aims at a total emission reduction of 40% by 2030 for all sectors together as part of the Paris Agreement. The LULUCF proposal regulates a “no debit” target for LULUCF (Forests and Agricultural soils), and regulates the accounting of any additional mitigation potential that might be expected of it. We find that the forest share of the LULUCF sector can achieve much more than what is in the regulation now. We elaborate a strategy for unlocking European Union (EU) forests and forest sector potential based on the concept of “climate smart forestry” (CSF). We find that to-date, European policy has not firmly integrated forest potential into the EU climate policy framework. Nor have climate objectives been firmly integrated into those of the forest and forest sector at either the EU or national level. Yet a wide range of measures can be applied to provide positive incentives for more firmly integrating these climate objectives into the forest and forest sector framework. With the right set of incentives in place at EU and Member States levels, we find the current literature supports the view that the EU has the potential to achieve an additional combined mitigation impact through CSF of 441 Mt CO2/year by 2050. In addition, CSF, through reducing and/or removing greenhouse gas emissions, adapting and building forest resilience, and sustainably increasing forest productivity and incomes, tackles multiple policy goals.